The goal of this analysis is to calculate the maximum pushing force that a cart can generate when is slowly pushes up against another object (we are neglecting impact forces). A hand writeup of the analysis shows the equations, while the images and videos below describe the physics in more detail. When cart pushes heavy loads, sometimes the back wheel which is connected to the motor may slip. Sometimes, the motor may stall. In this experiment, we need to figure out what may cause the back wheel to slip or the motor to stall. This is a cart with a timing belt drive power system. Here is an interesting Youtube video covering the wheel slip and motor stall. In order to figure out the what may cause the cart wheel to slip or motor to stall, we need to separate this experiment into two parts. Frist, we need to figure out how the timing belt power train works. Second, we need to focus on the cart movement and find what may cause the cart wheel to slip or motor to stall. A timing belt is a non-slipping mechanical derive belt. It is made as a flexible belt with teeth moulded onto its inner surface. It runs ove matching toothed pulleys. If we know the torque of the motor which is mounted into the first bracket, how many torque can be transmitted out to the second bracket? From the above figure, the shaft of the motor is mounted into the center of bracket 1. 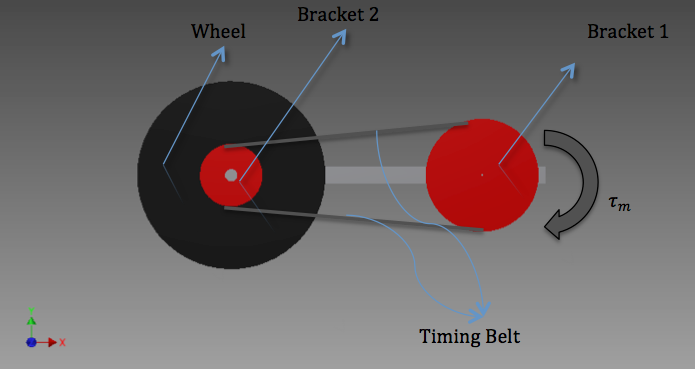 Then, bracket 1 is connect to bracket 2 by using the timing belt. Last, bracket 2 shares the same rotating shaft with the wheel. Now we know that the output torque of the second bracket is τout . Because the output bracket and the wheel shares the same rotating shaft, the torque of the wheel is the same to the torque of the second bracket. 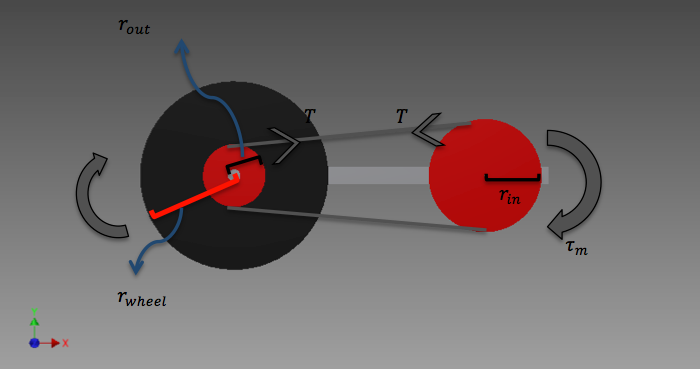 As a result, the torque of the wheel is τout = τm * (rout / rin). Last step, after we know the torque of the wheel, we can use Force = Torque / distance, to find what is the force corresponding to the torque. Part 1 is done. Then we need to use the output torque of the wheel to figure out when the wheel will slip or when to motor will stall. In this part, after we know the torque of the wheel is τout = τm * (rout / rin), we need to figure out when the wheel will slip and when the motor will stall. There is no friction lost. Sum of forces in the x (horizontal) direction should be 0. Pointing to the right is the positive direction. Sum of forces in the y (vertical) direction should be 0. Pointing to the top is the positive direction. Sum of the moment in the direction pointing out of the screen should be 0. Pointing out of the screen is the positive direction. Moment is force corss produce the arm. Check what is cross product. In order to figure out whether the wheel will slip or the motor will stall. We need to compare the friction force with the force transmitted out from the torque of the wheel.